Excerpt from U.S. Coast Guard “Proceedings of the Marine Safety & Security Council” magazine by CAPT Stephen Metruck, U.S. Coast Guard Commander, Sector Seattle. This scenario highlights the ever-present challenge faced by the Coast Guard’s command centers as they try to determine whether threats exist to or from the vessels operating here, and how to best work with other agencies and armed services to resolve and respond to them. At Sector Seattle, Wash., the Coast Guard has created a Joint Harbor Operations Center that has become the nation’s benchmark for federal, state, and local maritime interagency coordination and interoperability in evaluating and responding to maritime threats. 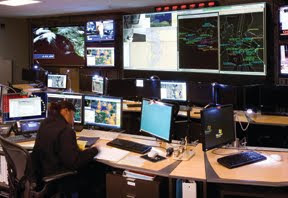 In May of 2007, the U.S. Coast Guard established the initial operational capability of the Puget Sound Joint Harbor Operations Center (JHOC), designed to identify and respond to all threats to maritime safety, port security, and the environment. This followed an August 2005 memorandum of agreement (MOA) between the U.S. Navy Vice Chief of Naval Operations and the Coast Guard Vice Commandant to leverage the sensor, detection, personnel, and communication and decision-making systems of each partner. The result: a more accurate and timely common operating picture in Coast Guard sector areas of responsibility with a large Navy presence. Walking into the JHOC in Seattle, a visitor immediately notices the complex video display “Wall of Knowledge,” with the vast array of visual information sources available to a JHOC watchstander at a glance. Each watch station has four or five computer monitors on the desktop in addition to the large-format screens on the front wall, each one capable of displaying different applications or tactical information (see picture). The communications specialist monitors seven different radio systems. Over 70 multi-agency cameras are integrated into the sensor management system. On top of that, there are more than 40 different data sources the watchstanders have access to. There are several initiatives to integrate this information—Watchkeeper, a new software suite being developed at USCG headquarters, the JHOC’s own quick-response checklists, and command duty officer and watchstander training based on realistic scenarios. Initiatives with the Department of Homeland Security-sponsored university centers of excellence, military research and development centers such as the Coast Guard Research and Development Center and SPAWAR, and self-initiated demonstrations and trials at the local deckplate level are paving the way for intelligent applications that will free decision-makers to make decisions rather than sift through data. Today, that same small boat described in the scenario at the beginning of the article may have hoped to remain concealed while observing the transit. However, our sensors can now penetrate the fog to detect the boat. Observant watchstanders, attuned to picking out anomalies, would alert the Coast Guard command duty officer, who could request that airborne assets track the small boat to its destination. Within five minutes of returning to a local marina, the owner of that small boat might get a call from the USCG command duty officer asking if he was having engine problems. Coordination like this is possible only through the concerted and sustained outreach effort that brings all port stakeholders together with one aim—to contribute to port and national security, safety, and environmental protection through information sharing and coordinated processes.